Amazing work, i have no words.. WOW, i wish i had pot with gold to give you.. Yes, I wish you had! Just kiddin', I''m glad you like it! Hey Sorry for my noobness... does this editor works as a stand alone or we still need to have the synth attached to it? It's only an editor so it only works with the G2 attached. Windows only? Delphi? I had to check the date on my Mac and make sure it wasn't 1997 anymore. Time for you to boot up the ol' XCode and code up a Mac version then! I know, I know. But in the spirit of avoiding obsolescence and making an open-source editor, it seems odd to develop for one platform only... particularly a platform that is itself becoming obsolete. There is now a cross-platform Delphi compiler called XE2 but I don't know how it handles the GUI differences between the two platforms. The Clavia G2 editor still works fine on Mac OS 10.8 and my old XP machine so I personally have no need for the open-source editor... yet. particularly a platform that is itself becoming obsolete. Do you mean Delphi is becoming obsolete? Maybe... I've made this in Delphi for windows because I don't have a mac, and happen to have access to a Delphi xe2 compiler. It's also the language I'm most familiar with. But I already compiled it with Freepascal for Linux once and did a testrun. 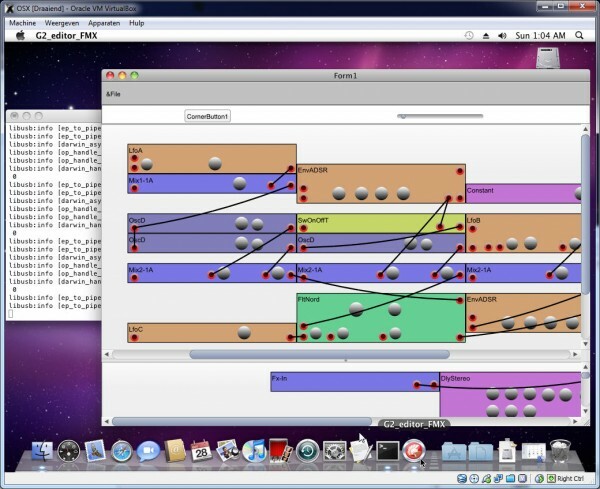 Mac is also possible with Delphi xe2 or Freepascal. It's not so much the tools that are the bottleneck for developement, it's the amount of time people are willing to put in to it. All the knowledge how to communicate with the G2 is in the source code and pascal isn't a very difficult language to understand. Someone familiar with c++ should have no problem understanding it. You can read all the source code on the sourceforge page. Whatever tool you use for coding, the difficult parts for crossplatform development will be in the peripherals: usb interface, midi interface, graphics. For the moment I'm sticking to Delphi/pascal but willing to help out anyone who wants to port it to another language. 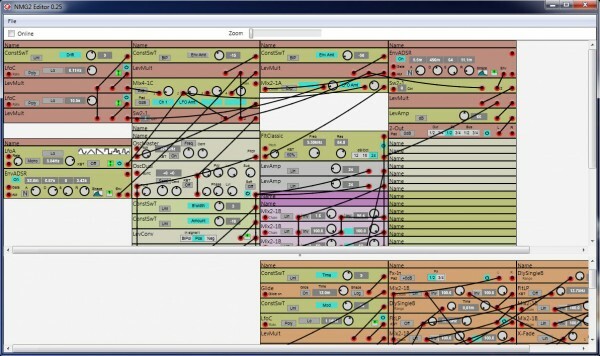 You can drag OSCA boxes into the grid, and then twiddle knobs and click buttons - that's it. I may get bored with this soon - it's not really a project yet and there will be a large heap of work before this is useful even as a mock GUI, your work in such a short time is incredible brunov! - but I was thinking @brunov: can your server backend be modified easily to talk HTTP (I haven't looked at the source yet)? Then maybe this could be used as an alternative GUI. And if someone felt like exposing their G2 to the world this could be used as a public editor interface for anyone to abuse on the internet. There used to be a some good cable simulation Java code online. The network objects I use (Indy) also contain a HTTP server object, so I guess communication using http shoud be posssible. Maybe not for the very high volume messages like volume and led data. With most "patch building" messages, it's like the client sends a command message "add module" with parameters, then waits for the server to send a reply. I couldn't help but try out if these cross platform claims of Delphi XE2 where true, and to my surprise, I actually got it working Including usb interface! Here is a screenshot. It's running on snow leopard in oracle's virtual box. Graphics are a bit basic, but the patch there is actually loaded from my engine over the usb interface! Had to figure a couple of things out of course, but I was surprised how easy it went. With linux and freepascal I had a much harder time. Whats ure thought on notification mail to all members once brunov think this is done? After all the work and effort brunov have put into this, i think its completely worth it..
Haha, I didn't understand anything; I thought you meant Mac was the obsolete platform... and I was planning to change to be "Brunov,s editor compatible". Anyway, thank you for that work. I wish I had a pot with gold to give you... and for Tim, Howard, Rob, Blue Hell, Varice, iPassenger, Roland, Afro88, 3Phase, ian-s, chet, ik, davep, King Rat, dorremifasol and all the other great programmers and posters of this community. ...I wish I had a pot with gold to give you... and for Tim, Howard, Rob, Blue Hell, Varice, iPassenger, Roland, Afro88, 3Phase, ian-s, chet, ik, davep, King Rat, dorremifasol and all the other great programmers and posters of this community. I have learned very much about modular patching and other synthesist techniques with the help of the generous contributions to this G2 forum, and even beyond to the Lunetta and DIY sections. I second your praise. This electro-music forum is a great community. Hey xav, frankly I don't worry too much about things getting obsolete. There's always someone who finds a trick to get the old stuff working again. This os editor is just something I like working on in it's own right because it's something different from the software I have to develop for work and it's nice to have discussions about it here on the forum with you all. Anyways averyone, thanx for the support! Such a pity that you are a programming illiterate But maybe you're an computer graphics artist? I have discovered that I'm really bad at computer graphics. I think I can maybe do the application code part of an osx application, because Delphi lets me compile for Osx, but when it comes to specific osx knowledge or computer graphics I'll have to throw in the towel. What I would like to do is make some sort of application framework that is decoupled from the graphics. So someone who is more capable can design a skin for the application. I could reuse a lot of the code that handles the loading/saving of g2-files and sending messages over the usb interface from the windows application. The main thing that would have to be made from scratch is the gui. I would like something that you can zoom in and pan. That's not so hard to make in the new delphi compiler since they are all focussing nowadays on the growing tablet market. The only thing is that you have to use graphics that allow scaling. So in the screenshot I made a test application and with the 'Zoom' slider you can enlarge the gui. You can see in the zoomed-in picture that the bitmap/raster graphics become very ugly when enlarged, for example the waveform icons on the LfoA. What I would like to do is enable the application to load SVG graphics (http://nl.wikipedia.org/wiki/Scalable_Vector_Graphics) in stead of the bitmaps and maybe also for some of the controls and panels. 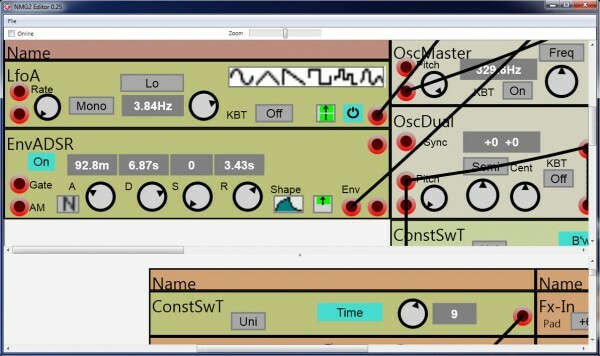 So anyone could design parts of the gui using for example http://inkscape.org/ and then give it the appropriate filename so the application can use it in the gui. There will be quite a lot graphics that have to be designed. But that's basically the status right now: a couple of ideas and modest progress on the application. The main thing is that I don't want to work on it alone anymore, I think the project needs some other people involved not to grind to a halt. do you think it would be possible to port the editor ios for the apple i-pad? And can you explain a bit more what graphics work you would need? But it's only in a beta stage right now. Apart from compiling the code, there's also the question of the USB interface. I'm using the Libusb library. There are versions of libusb for Windows, Osx and Linux, but I don't now about iOS. And another thing I'm not really sure about is how the edtor will perform on an Ipad. Maybe someone knows an ipad application that's a bit similar as the g2 editor, so we can get an idea what is possible. I don't have an ipad myself. In any case, if the editor is to run on an ipad in future, the user interface has to be adapted and that's also necessary for making a cross platform Windows/OSX version. To make the edtor ipad-ready, you'll probably have to be able to zoom-in, zoom-out, pan etc. Otherwise you'll never be able to operate the modules or connect cables with your fingers. There is the SVG graphics standard (http://www.w3.org/Graphics/SVG/) that is developed for webbrowsers that allows smooth scaling. And there is already some support of this type of graphics in Delphi. What I would like to do is to develop some user interface objects based on the SGV standard. So the graphics design can be done seperately from the application coding. What I could do is export all the images from the current editor to file using a specific naming convention. These can then be recreated as SVG graphic, using for example Inscape. Because of the naming convetion, the application knows where to use them in the gui. That's a bit more complex beause the application must be able to change certain parts of the graphic to animate them. In SGV different parts of a graphic can be given an ID. For example a led has two states so in the SVG graphic maybe two layers can be created representing the two states of the led. Then the application can turn the led on by making layer with ID2 invisible or off by making layer with ID1 invisible. Maybe for each control a skeleton SGV graphic can be created already containing the layers/parts with the appropriate ID's to link them in the application. Then the graphics designer can adapt the skeleton SGV to make it more visiually appealing. What I would like to do first is to develop the SGV object for Delphi and to make some sample/test applications for Windows and OSX to test some things out. sounds interesting.. i am no graphic designer..but maybe would like to help..
maybe its possible to design a base layout and than just split the mindless repetetive task to get it transfered to all modules? anyway..just downloaded the editor and try it..
i just try your editor and read about the hidden modules..really nice..
where are the limitations of the opn source editor right now? is it possible to enable some other of the hidden modules? like the blue to redconverter or the dx env? Thanks for your offer to help out Sven. About the missing modules. I found these trying out some "add module" message with different parameters. In the list shown here, apart from the Driver/Resonator only the Blue2Red and Red2Blue also seem to work. Any idea what these could be used for? // 35 Driver -> Works! // 56 Resonator -> Works!